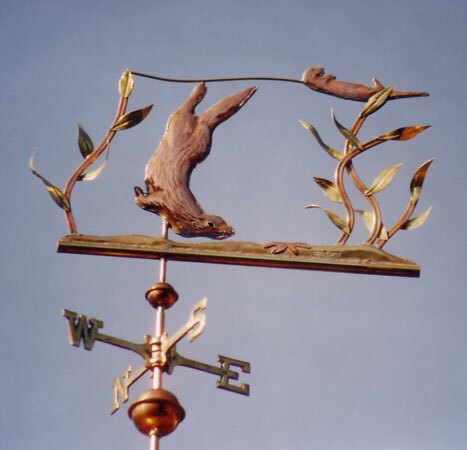 This Diving Sea Otter Weather Vane, Enhydra lutris, is one of our more active designs. You can see that the mother sea otter has safely tethered her pup in the kelp while she dives down to the sea floor to catch a star fish for its dinner. In the example shown, the mother otter, the otter pup and the starfish were made in copper while the kelp leaves and sea floor were made in brass. Both the adult sea otter and the pup have brown glass eyes with black pupils to give them a more lifelike appearance. A friend and fellow sea otter enthusiast commented that all our Sea Otter weather vane designs revolve around the otters eating food. The only thing I can think is that I must have worked on each of these designs just before lunchtime. If you also love Sea Otters but prefer one doing something other than eating a tasty meal, just let me know. I would be happy to work with you to come up with something new; I’ll just make sure that I work on your design sometime in the early afternoon! In most of its range, the sea otter is a keystone species, controlling sea urchin populations which would otherwise inflict extensive damage to kelp forest ecosystems. Its diet includes prey species that are also valued by humans as food, leading to conflicts between sea otters and fisheries. Their populations were once estimated at 150,000 -300,000, but they were hunted extensively for their fur between 1741 and 1911. During this time the world population fell to 1,000 -2,000 individuals in a fraction of their historic range. A subsequent international ban on hunting, conservation efforts, and reintroduction programs into previously populated areas have contributed to numbers rebounding, and the species now occupies about two-thirds of its former range. The recovery of the sea otter is considered an important success in marine conservation, although populations in the Aleutian Islands and California have recently declined or plateaued at depressed levels. For these reasons (as well as its particular vulnerability to oil spills) the sea otter remains classified as an endangered species.